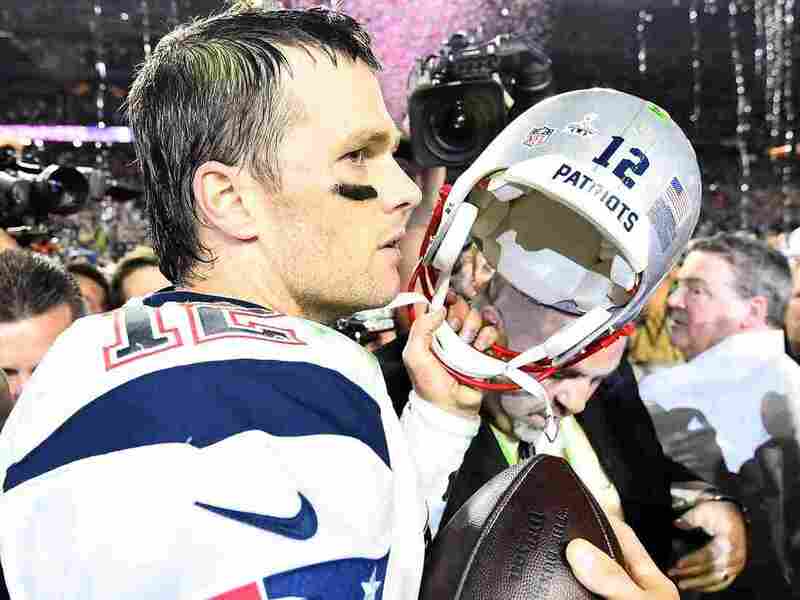 NFL Suspends Tom Brady For 4 Games Over 'Deflategate' Scandal : The Two-Way Days after a lengthy report found it was "more probable than not" that quarterback Tom Brady knew of rule-breaking, the NFL suspends him for four games next season and fines the Patriots $1 million. New England Patriots quarterback Tom Brady has been suspended without pay for the first four games of the 2015 season, for "conduct detrimental to the integrity of the NFL." Days after a lengthy report found it was "more probable than not" that New England Patriots quarterback Tom Brady knew of rule-breaking, the NFL has issued its punishment: a four-game suspension for Brady and a $1 million fine for the Patriots. Brady will sit out the first four games of the 2015 regular season without pay, the NFL says, citing "conduct detrimental to the integrity of the NFL." The Patriots will also lose their first-round pick in next year's draft, along with a fourth-round pick in 2017, over the incident known as "Deflategate," in which Brady was accused of using underinflated footballs during last season's AFC Championship Game. The Patriots won that game handily and went on to win the Super Bowl. Don Yee, Brady's agent, says the decorated athlete will appeal the NFL's decision. Yee released a statement Monday saying, "The discipline is ridiculous and has no legitimate basis. In my opinion, this outcome was pre-determined; there was no fairness in the Wells investigation whatsoever. There is no evidence that Tom directed footballs be set at pressures below the allowable limits." He later added, "The NFL has a well-documented history of making poor disciplinary decisions that often are overturned" upon review. News of Brady's suspension follows the release Wednesday of a 243-page report that was commissioned by the NFL. It cited evidence from scientific studies to phone records and concluded that "it is more probable than not that New England Patriots personnel ... were involved in a deliberate effort to circumvent the rules." Brady and Patriots coach Bill Belichick have denied knowing anything about how the team's footballs are prepared for games. But today, the NFL said the Patriots had violated the league's policy on integrity and its rules of the game. It also faulted both Brady and the Patriots organization for not cooperating with the inquiry. The investigation into why some of the Patriots' footballs were inflated notably below the league's required levels unearthed text messages and other communications between two of the team's employees, who joked about Brady's preference for underinflated footballs. One of the men, the officials' locker room attendant James McNally, was referred to as "the deflator." The NFL report laid out a scenario in which McNally would use a needle supplied by equipment assistant John Jastremski to deflate footballs after they had been inspected and approved by game officials. The report also quoted messages that referred to gifts McNally received. In a statement issued Monday afternoon, the NFL said the Patriots had suspended McNally and Jastremski indefinitely, without pay. The league added that the two could not be reinstated without the NFL's approval, and that they could not be involved with preparing or handling footballs next season. "It is impossible to determine whether this activity had an effect on the outcome of games or what that effect was. There seems little question that the outcome of the AFC Championship Game was not affected. But this has never been a significant factor in assessing discipline. There are many factors which affect the outcome of a game. It is an inherently speculative exercise to try to assign specific weight to any one factor. The key consideration in any case like this is that the playing rules exist for a reason, and all clubs are entitled to expect that the playing rules will be followed by participating teams. Violations that diminish the league's reputation for integrity and fair play cannot be excused simply because the precise impact on the final score cannot be determined." Vincent also touched on the level of proof the NFL requires before it takes punitive action, saying, "we applied the standard of proof stated in the Integrity of the Game Policy: namely, preponderance of the evidence, meaning that 'as a whole, the fact sought to be proved is more probable than not.' "